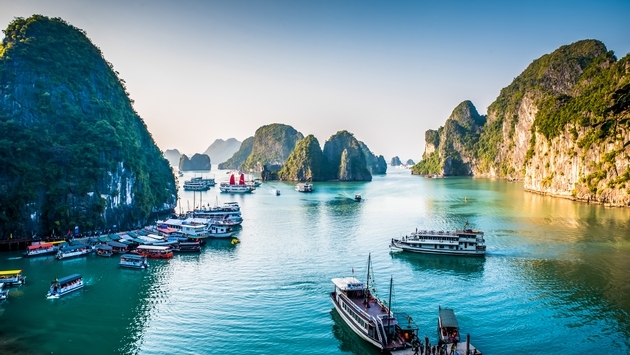 With its picturesque, towering limestone islands and its emerald waters plied by junk boats, Vietnam’s Ha Long Bay is easily one of the highlights of any visit to Vietnam. But with such beauty, there’s always a risk of overdevelopment and it appears Ha Long Bay, which was named a UNESCO World Heritage Site in 1994, just may be the latest to fall victim to this truth. In 2017, the bay, which has a population of about 1,500 permanent residents, was visited by about seven million international and domestic tourists, according to the South China Morning Post. While that figure may seem overwhelming, it's not nearly as staggering as the region’s goals for the future. Citing data from the Halong Bay Tourism website, the South China Morning Post has reported that local officials hope to increase arrivals to 16 million by the end of next year, which would bring in between $1.3 and $1.7 billion in revenue. To help reach that goal, a new airport has just been opened. Van Don International Airport began operating on December 30. The new facility dramatically reduces travel time to Ha Long Bay for those coming from overseas. What used to be an eight-hour round-trip journey to the stunning bay from Hanoi now takes just over an hour. Once the new airport is fully operational it will connect some 35 cities, Hong Kong and Macau among them, to the bay. Combined with other recent developments, this news may well be the straw that breaks the camel's back for Ha Long Bay, a giant conservation zone that’s home to some of the rarest species of flowers in the world, as well as being the base for a variety of tropical ecosystems, including a mangrove ecosystem and a reef ecosystem. A newly unveiled highway that was created to reduce the travel time between Hanoi and Von Don to two hours and 30 minutes, was unveiled around the same time as the airport. And an international cruise port capable of accommodating two liners at a time, carrying as many as 8,460 passengers and crew has also been added to the mix, according to the South China Morning Post. This sentiment has since been echoed again and again over the years. A bay where expeditions take visitors past islands named for their shapes, including Stone Dog and Teapot islets, many tourists complain of overcrowding and debris in the sea. Last summer alone, volunteers collected more than 1600 pounds of waste from Ha Long Bay’s Coc Cheo and Ang Du beaches. The International Union for Conservation of Nature (IUCN) created the the Ha Long – Cat Ba Alliance in 2014 to preserve the natural integrity of this globally significant area and embarked on a three-year initiative funded by the United States Agency for International Development (USAID) that aimed to build partnerships between the Vietnamese government, businesses and civil society, catalyzing actions that might improve environmental management and protection of the bay. Due to the rapid pace and often unplanned nature of this development, local communities are not equipped to deal the variety of ensuing social and environmental pressures. Further underscoring this concern, the IUCN earlier this month issued a new report from two consultants which concluded that "while the geological values of the site are currently not threatened, with continued growth in visitor numbers and ineffective management of visitors and waste, the impacts on the site’s aesthetic values will cause a significant threat." "The 2017 Global Travel and Tourism Competitiveness Report showed that while Vietnam’s natural and cultural attractions ranked 30th and 34th, its environmental sustainability ranked 129th out of 136 countries with very low scores for wastewater treatment, coastal and forest conservation." 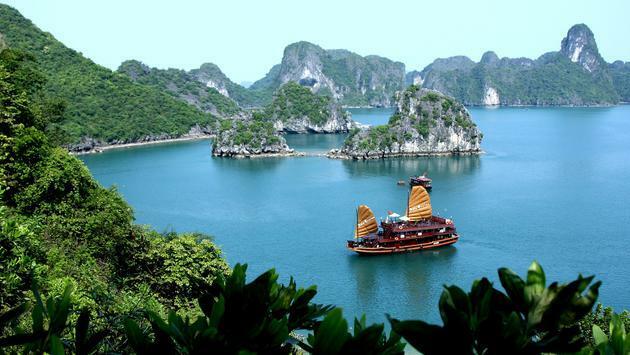 "Given Vietnam’s natural beauty, coastal tourism should be an engine of economic growth but if done in ways that are environmentally wasteful, the engine risks stalling."